Now and then I try to do some housekeeping of my too numerous files on this computer as well as the archives of this blog. 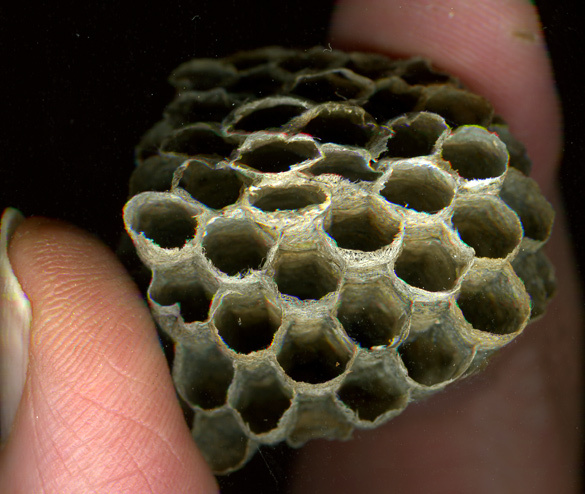 In my recent rounds, I came across some more photos of one of the wasp nests as seen in Hand with Wasp Nests, so I have placed them in their new home here. The lower image reveals the amazing underside with an odd cap on top, presumably the sticky patch that enabled it to be attached to the wood frame of a skylight in our solarium. You may have seen the original photo of its face. First, I have to say I'm glad that was a small wasp's nest you had in your sun room. It really is very delicate looking held between your fingers. The second picture looks as though the entire nest is made of the finest silk in colours so subtle I'd expect to see them worn by a well born Japanese lady. Funny, where my imagination takes me. silky surface? Those nests probably do have it. But I can't resist, I got to tell what I heard in our Public Broadcasting Radio 1 feature telling yesterday. It was a story of older woman, Chiara Vigo from South East Sardinia, who is the last one weaving silk images out of sort of mollusk living on the waters (Finnish name is silkki-simpukka). The animal is giving out some substance, that is weavable into some kinda thread, and then you only need the wooden looms to make almost transparent cloth, which is called silk. 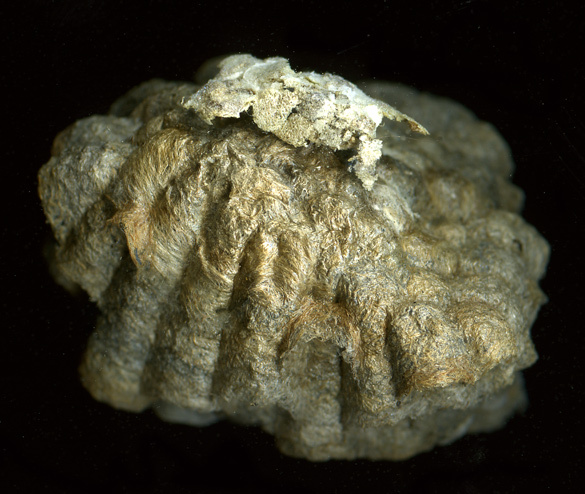 Sardinians have learned to get the substance out of these oyster-type of animals without killing it. They take the stuff and put the shell back on it's place. I'm left surprised even with the fact that Sardinian waters could be that clean. She's in Wikipedia or other site in net and you can look yourself. There is some reason, why construction of different animals tend to have same type of surface, and one silky thing, often photographed is a spider net. But spider nest also catches the food that the spider need! Maybe there's some chemical substance what all animals can produce, some similarity about them? Susan, I like where you imagination takes you. In fact, the next comment really picks up on the silk! Marjatta, that is amazing - I'd never heard of this kind of silk or this creature! I did a search and found many including this page called Chiara Vigo, Master of Sea Silk. Do check out the first link there, dear readers, and if you can read Italian, Chiara Vigo also has a blog. Fascinating. Kiitos! I've just come back from reading that blog post you linked to about this material call Byssus. What an extraordinary thing to learn and the lady, Chiara Vigo, is the last of those artists. The thread material can only be collected once a year during a very short and specific time. Then 10 grams only makes 1 gram of thread - such patience and skill is really marvelous. Thanks to Marjatta and you for this wonderful lesson in human creativity using the magic of the natural world. Susan, I'm glad you read about this Sea Silk called Byssus and the artist who worked with it. It really is an astounding material and skill. All thanks really go to Marjattta - what timing for her to hear that radio program then share it with us.